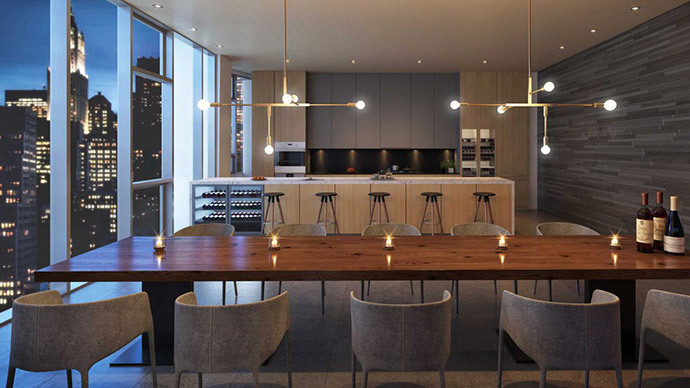 Limitless luxury awaits homebuyers at the new Vancouver luxury condo project called One Burrard Place, a master planned downtown development of the entire 1200 block of Hornby Street off Burrard Street. The centrally located and luxurious Vancouver Burrard Place condo high-rise is designed by world renowned and award winning IBI Group Architects. The iconic architecture gives the downtown Vancouver skyline the 3rd tallest skyscraper in what is fast becoming the neighbourhood of choice for urbanites. 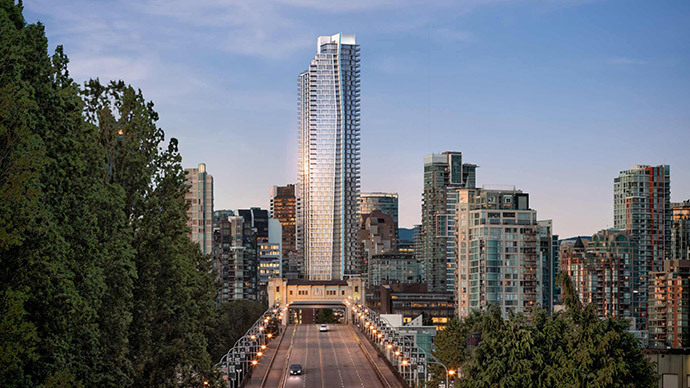 Just steps away from the historic bridge, the 550 foot high Vancouver skyscraper will signify the gateway to the downtown core. The architectural design by IBI Group Architects for the One Burrard Place Vancouver luxury condo tower maximizes views of the mountains, city and ocean in addition to being built to environmental LEED Gold Certification, making it one of the greenest projects in the Lower Mainland to date. 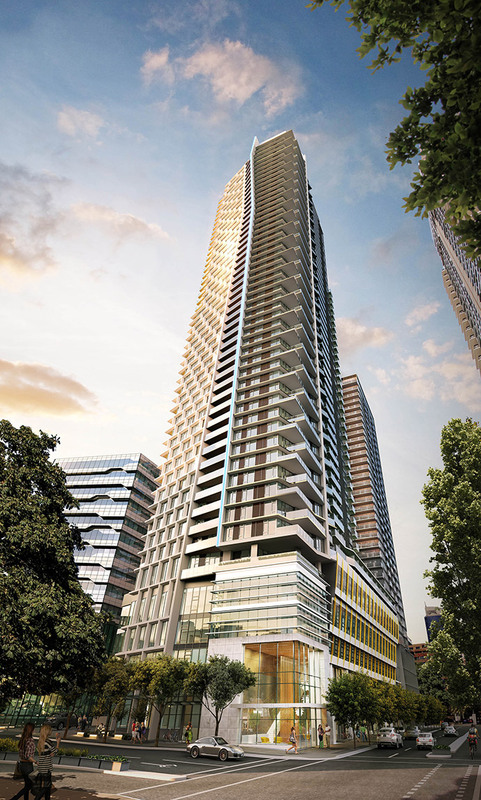 As one of the last remaining tall building sites in Downtown Vancouver real estate district, One Burrard Place luxury condos will join an elite group of residential towers that can truly be called a skyscraper. Most of the principal rooms and living spaces in this high-rise will feature spectacular views. 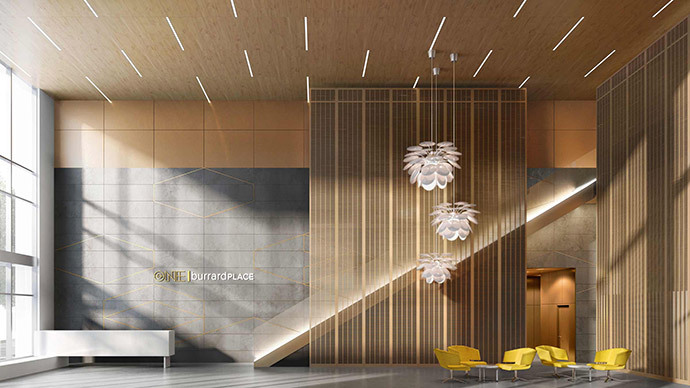 The development will also have a 24/7 Butler Concierge service at the Main Lobby as well as Club One at Burrard Place on-site amenities on the 7th floor. 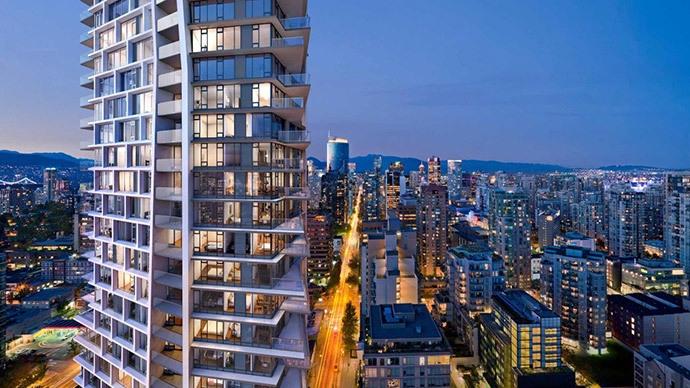 The 60 storey Vancouver skyscraper will also feature a fully secured, camera controlled underground parking garage, rough-in for an alarm system in-suite as well as hard wired smoke detectors and secure floor-by-floor restricted fob controlled access. A grand sense of arrival awaits residents and visitors with a marbled porte cochere, double height lobby and iconic architecture. Exclusive private dining experiences are also available with a private find dining venue, private shopping salon and a temperature controlled wine cellar and tasting room. 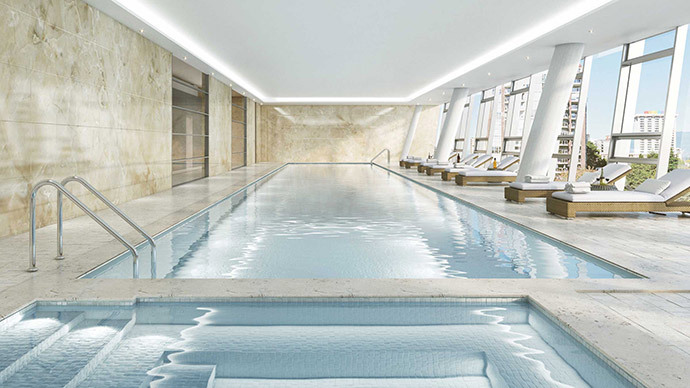 The in-house luxury amenity experience includes a full length swimming pool with steam room, sauna and hot tub. The One Burrard Place Vancouver luxury condos also features a private health club with a fitness centre, indoor and outdoor yoga centre, spa and wellness centre and much more. All homes at the luxury Vancouver One Burrard Place condo tower will come with the New Home Warranty. For more details, please visit www.burrardplace.ca today. The prevailing sense of luxury extends from the exclusive residences to the 30,000 square foot private clubhouse space on the seventh floor which is called the One Burrard Place Club One amenity floor. Here at Club One, residents have exclusive access to a fully equipped fitness centre with a weight room, stretching area, men/women’s change rooms and indoor/outdoor yoga space. There is also a full length lap pool, hot tub, steam rooms and a sauna in addition to a private spa and multiple treatment rooms. The Club One at Burrard Place Vancouver will also feature a full time amenity butler concierge, indoor and outdoor large scale dining facilities and a temperature controlled wine cellar with wine attesting bars for a very luxurious amenity package. For families, there is a children’s club house with play room, workshop, party room, music room and study areas. The floorplates at Burrard Place Vancouver are divided into different levels. From floors 15-31, there is a wide range of studios (466-479 square feet), 1 bedrooms (464-570 square feet) and 2 bedrooms (815-948 square feet). Higher floors from levels 35-46 features only a single studio plan (467sf), 1 bedrooms (557-779sf) and mostly 2 bedroom floorplans (884-1,048sf). The top levels between 47-56 at the Downtown Vancouver One Burrard Place luxury condos features 2 bedrooms between 1,082-1,385sf and spacious 3 bedroom units between 1,536 to 1624 square feet. Some of the most unbelievable interior features include Gaggenau appliances (mostly integrated) as well as European style kitchen finishes with sleek and ergonomic cabinetry (wood veneer and lacquer combination) and integral door handles. Other kitchen features include soft touch self close doors and drawers and integrated waste bins. There is under cabinetry LED lighting with motion sensor lighting and the larger kitchens come with pull out pantry cabinetry. 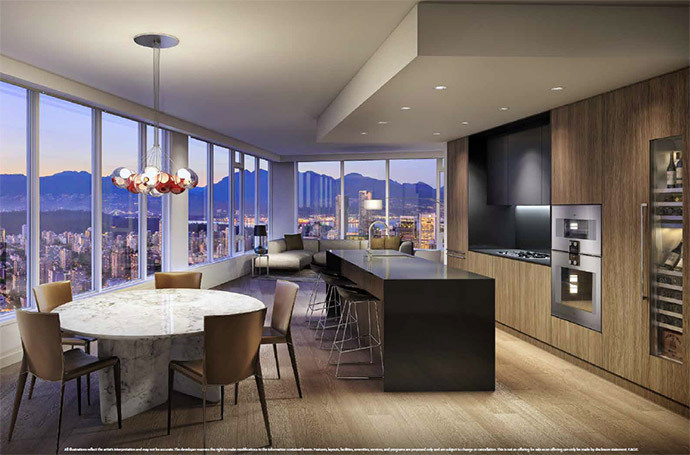 Floorplans with powder rooms at the One Burrard Place Vancouver luxury condos include a stunning Italian Lupi signature Corian pedestal sink, Italian Zuccheti wall mount faucet and dramatic stone slab wall with a Bocci 28 pendant fixtures. The sumptuous bathrooms at the Burrard Place Vancouver condos include Italian designed wood veneer vanities and medicine cabinetry, mirrors with integrated lighting, integrated vanity basin and countertop combination and a smoked glass shower enclosure. Other bathroom features include Nuheat heated floors, stone floors, marble stone slabs for the tub deck and surround as well as marble wall and shower surrounds. The luxurious bathrooms at One Burrard Place Vancouver condos also feature Duravit wall mounted toilets and Italian Zucchetti hand polished chrome bathroom faucets and shower bar. The contemporary and timeless interiors include 2 highly crafted colour pallets (Natural and Grey) and lofty 8’6” to 9’ ceiling heights. All homes come with Bosch washer and dryer, custom roller blinds, automated smart home automation controls for alarm, lighting and temperature in addition to Motion Sensor Lighting in closet, laundry and flex rooms. The studio floor plans come with a Wall Bed with Dining Table and Side Pods for storage. 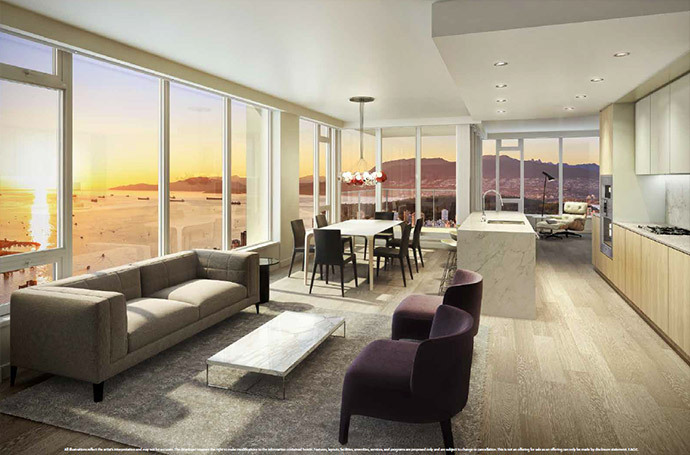 The luxury residences also feature a floor to ceiling glazed Curtain/Window Wall window system, central air conditioning, built in closets with mirror doors and organizers and wide plank hardwood floors throughout (stone floors in bathrooms). 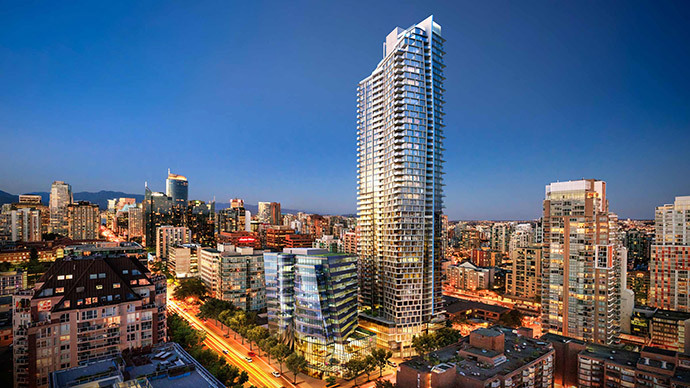 The iconic Burrard Place condos in downtown Vancouver are brought to you by an experienced team consisting of Jim Pattison Developments, Reliance Properties, OMB (Offices of Macfarlane Biggar), IBI Group Architects and Magnum Projects marketing. Here is some more information from their presale marketing materials: Covering a full city block, One Burrard Place will define a new neighbourhood and shift the heart of the city. Experience the beginning of an exclusive new downtown community. This prestigious address offers more than a place to live — this is a way to live. An elegant silhouette towering above its surroundings, the sophisticated confidence of this signature tower will become an iconic addition to a world–famous skyline. The Burrard Place Club One Star Services Team delivers an unparalleled luxury lifestyle experience. A first in Canada, this team of high–level hospitality professionals puts the very best of Vancouver at your service. In perfect alignment with the Burrard Street Bridge, One Burrard Place will forever define the southern gateway to the downtown peninsula. 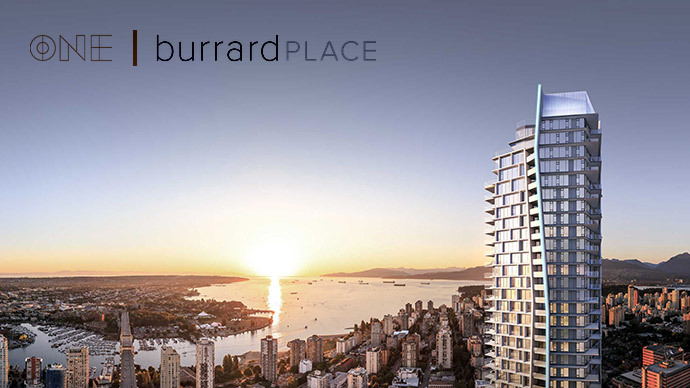 The services and amenities at Burrard Place set the standard for limitless luxury and offer a lifestyle that is refined, elegant and delivered with sophisticated simplicity. On downtown Vancouver’s southern shore, the Beach District connects the city to the sea and shapes the soul of one the world’s most desirable locations. This is the home of One Burrard Place. The Presentation Centre is located at 1290 Burrard Street Vancouver, BC. in the past 2 years! This is not an offering for sale. We use third-party advertising companies to serve ads when you visit our website. These companies may use information (not including your name, address, email address, or telephone number) about your visits to this and other websites in order to provide advertisements about goods and services of interest to you. If you would like more information about this practice and to know your choices about not having this information used by these companies, click here. The details and info written on Vancouver Real Estate Direct is not a solicitation for sale. This web site nor its writers is affiliated with any real estate developer, advertising or marketing team, condo development or real estate agent. The text content and published images on this website may not be 100% accurate. Vancouver Real Estate Direct does not accept responsibility for misrepresentation or misinformation. All web site content, including copy and images, is provided by contributing real estate enthusiasts and represent personal opinions and perspectives by the contributing public. No web site content, including text copy, images and graphics can be reproduced, duplicated or copied. Copyright 2012 - Vancouver Real Estate Direct.